The middle of 2011 has featured a tale of two summers, with a very warm August following a notably cool June and July. August was seasonally hot and dry in Central Washington, as the region returned to a more typical late summer weather pattern featuring high temperatures generally in the upper 80s to lower 90s. In fact, daily high temperatures were up to 2.2 degrees above normal during August. Wenatchee (WSU TFREC) was particularly warm both in the day and at night. The AWN weather network recorded its first 100 degree weather of the summer on August 26th and 27th. The century mark is a symbolic summer temperature threshold in this region, and exceeding 100 degrees indicates sweltering heat in central Washington. The AWN weather station at Orondo (north of Wenatchee) registered a high temperature of 101.5 degrees on August 27th. Overall, eastern Washington temperatures were above normal during August by one to two degrees, although temperatures remained slightly below average (-1 degree) at Mt. Vernon (WSU NWREC) in western Washington. Breezy conditions on August 30th ushered in a cooler air mass of Pacific origin, and the month ended with below normal temperatures, as most locations remained below 80°F on August 31st. It is fitting that the month of August ended as the season had began, with the cooler than normal temperatures that were commonplace throughout the spring and early summer. The average August temperature in Prosser was 70.8°F, which is 0.7 degrees (0.4 standard deviations) above the average of 70.1°F. In a reversal of another recent 2011 trend, the average daily high temperature of 87.9°F was 1.5 degrees (0.8 standard deviations) above normal, while the average daily low temperature was nearly average at 53.8°F. Throughout the spring, the daily high temperatures were below normal to a greater extent as compared to daily low temperatures. The coolest temperature of the month was 45.3°F on the 31st. In contrast to June and July, many AWN locations including Prosser remained completely dry in August with no rainfall during the month. The mean August wind speed at Prosser was weak at 3.7 mph. Interestingly, there was less day to day variability in daily high temperatures in August of 2011 than in any other August since 1990, which is similar to the spring trend of relatively minimal temperature variability. The warmest overnight low temperature of the month was 62°F on the 25th, while the coolest daytime high temperature was 75.8°F on the 31st. Generally, the trend of moderate conditions without particularly hot or cool temperatures continues, except that August was consistently warm while March to July 2011 was consistently cool. Overall, the summer (June through August) temperatures were equally below normal during the day and night by about one and a half degrees. However, the season was dichotomous with two separate temperature patterns. The summer season featured numerous bouts of cool daytime weather in June and July due to a greater than normal influx of Pacific air into the Northwest, while the central and eastern United States endured oppressive heat. The Northwest began to warm in August, as the rest of the nation received a reprieve from the scorching heat of July. Fewer Pacific weather systems passed through central Washington and so there was less cooling influence from the Pacific Ocean, which caused above normal temperatures. This warm weather was the result of the periodic presence of a stable ridge of high pressure that became more dominant in the month of August. Normally, August is slightly cooler than July; however August 2011 was by far the warmest month of this year. June and July of 2011 were quite cool, while August 2011 was the warmest August in the last five years. In fact, the pleasant late August weather was short lived, and a strong ridge of high pressure is expected to persist for some time, with above normal September temperatures continuing for at least the next seven days. There were six consecutive months of below normal temperatures at Prosser (WSU IAREC) from February through July. This string of abnormally cool months came to an end with above average temperatures in August. The Prosser average temperatures of 63.3°F in June and 68.6°F in July were 2.2°F (one standard deviation) and 3.7°F (1.4 standard deviations) below normal, respectively. July (June) was ranked second (fourth) coolest (out of 21 years) in both the average and average daily high temperature categories. The average June and July high temperatures were 2.4°F (0.9 standard deviations) and 4.3°F (1.3 standard deviations) below normal. Even the average low temperature in July was relatively cool at 3.2 degrees (1.3 standard deviations) below normal. The warmest temperature recorded in June (July) was 89.6°F (94.6°F), which was 4.5°F (5.2°F) degrees below normal, and well below the record of 105.1°F (105.7°F). 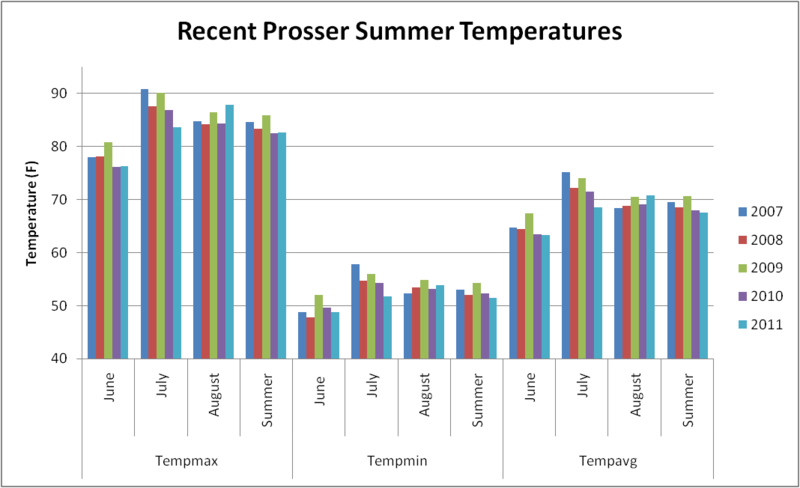 The average summer temperature in Prosser (67.6°F) was 1.7 degrees (1.1 standard deviations) below average due to a cool June and July, and in spite of a warm August. The average summer high temperature of 82.7°F was 1.6 degrees (0.9 standard deviations) below average, while the average summer low of 51.5°F was also 1.6 degrees (1.1 standard deviations) below average. 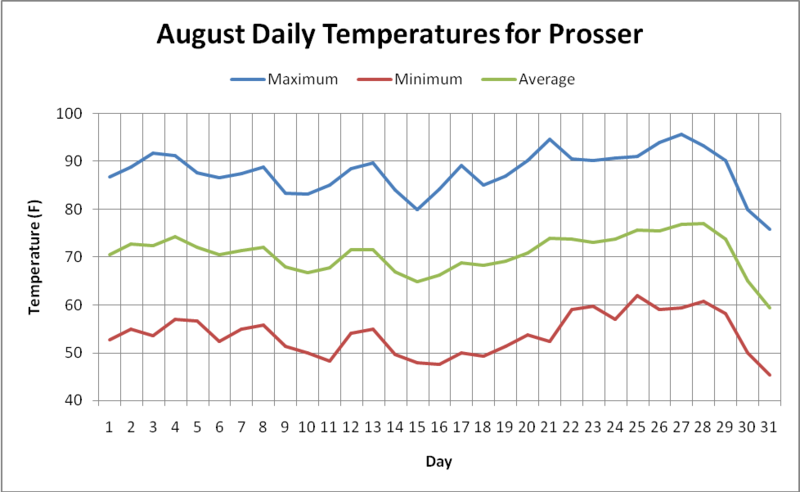 The warmest temperature of the summer at Prosser was 95.7 degrees on August 27th, while the normal maximum summer temperature is about 101 degrees. The coolest temperature of the summer (40.1°F) was near normal. Overall, summer 2011 ranked 5th, 2nd, and 3rd coolest in terms of daily high, daily low, and average temperatures. *June 8th: The high temperature at Prosser was only 64.5°F. *July 25th: Intense rainfall associated with a cold core weather system and embedded thunderstorms produced numerous lightning strikes and 0.23 inches of rain at Prosser in 15 minutes. *August 27th: The high temperature at Orondo was 101.5 degrees, which was the warmest temperature of the summer. * June: Below normal temperatures. * July: Well below normal temperatures and typically dry. * August: Above normal temperatures and very dry. 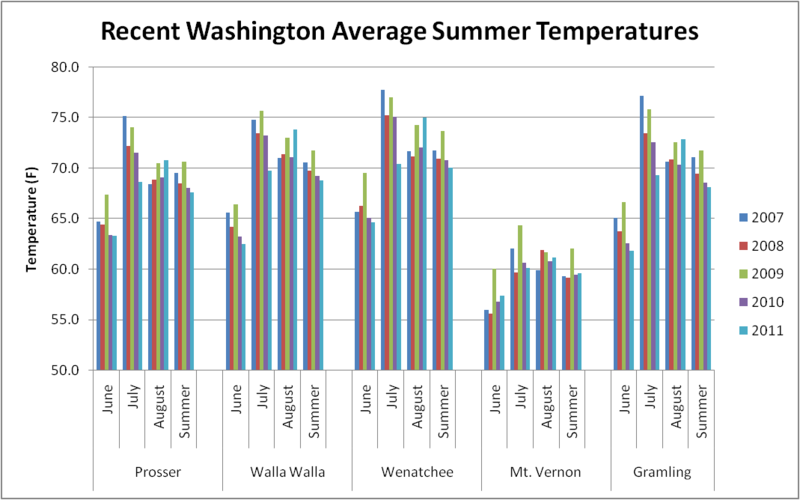 Initial reports indicate that the 2011 Washington apple crop will be down 3% compared to last year due to the cool and wet spring. By contrast, a 20% decrease in wine and juice grape production in 2011 has been observed due to damage received during the autumn freeze in November 2010. However, pear growers report good bloom and fruit set, along with excellent fruit quality this year. Overall, despite a cool spring and an initially delayed growing season, the summer growing conditions have been excellent, and Washington prune production is expected to increase in 2011. Although the anomalous weather had some effect on peaches, they have generally matured well. Fruit quality and sizing was helped early on by the slow and cool growing season (National Agricultural Statistics Service). The Prosser 5 Year (2006 to 2010) Average Accumulated Growing Degree Days (GDD) for April 1 to August 31 is 2067 GDD, but the 2011 accumulated GDD is below normal at 1743 GDD. The current ENSO neutral conditions in the tropical Pacific are likely to persist into the fall of 2011, and therefore the temperature outlook for the coming months is uncertain since there are limited climate signals for this already difficult-to-forecast autumn season. In a subtle shift since earlier in the summer, recent climate models now indicate that either ENSO neutral or La Niña conditions are possible beginning in the winter of 2011/2012. * On August 4th, 1998, the temperature at the WSU TC site in the Tri-Cities rose to nearly 107 degrees. * Despite the cool weather in June and July that made this summer season Prosser's third coolest since 1990, summer 2011 was still two degrees warmer than the summer of 1993!